Cat in the Hat, Thing 1, and Thing 2!! This homemade costume for kids entered our 2013 Halloween Costume Contest. 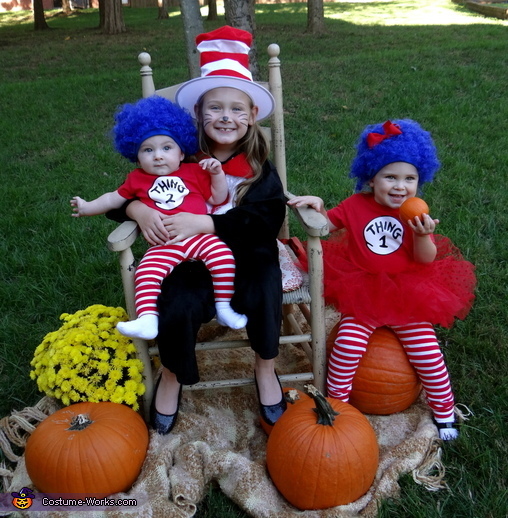 Bella, Mimi, and Wilson are The Cat in the Hat, Thing 1, and Thing2! I like my kids to dress up together for Halloween. With the addition of our baby boy this year it was the perfect time to do this. I put the Thing 1 and Thing 2 costumes together with t-shirts, striped leggings, and homemade wigs. I added a bow to the wig and cut an adult tutu to fit my 2 year old daughter. I spent less than $100 on all 3 costumes. Oh my!! How great, such a good idea. I absolutely love it! I'm actually going to do this next Halloween.